When MTV showed reruns of Monty Python’s Flying Circus back in the late 1980s, each episode was preceded by a “viewer advisory” warning that some of the material might be offensive to some viewers. In what may have been a misguided effort to make the channel feel less square about making that announcement, the advisory came in the form of a brief, clumsy imitation of Terry Gilliam’s inimitable animations. It was one of the most grotesque things ever seen on MTV during its first decade, which is saying something. 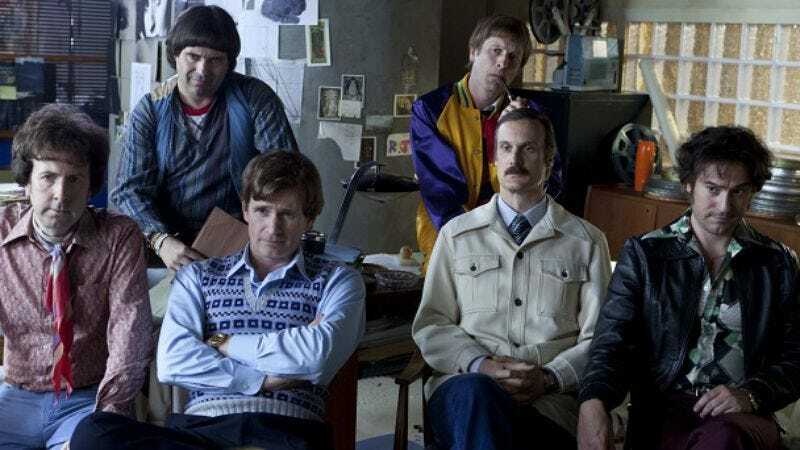 The TV film Holy Flying Circus is clearly a labor of love, and it’s hard not to feel some respectful affection for anything that loves the same thing you do. At its best, it’s a very clever and imaginative piece of work. But at its worst, it’s the first thing I’ve seen in more than 20 years that’s reminded me of that viewer advisory. Written by Tony Roche, who worked on the BBC series The Thick Of It and its movie spin-off, In The Loop (as well as the upcoming HBO show Veep), Holy Flying Circus takes off from the controversy surrounding the 1979 Python film Life Of Brian. The story of the making of the film has been told many times, most recently being touched on in Martin Scorsese’s George Harrison documentary for HBO. (Harrison set up the production company HandMade Films specifically to fund the project after the original financiers backed out at the last minute.) Roche and the director, Owen Harris, aren’t interested in how it got made, only in the reactions it inspired and what the Pythons had to go through because of those reactions. And though it builds to the notorious televised debate in which John Cleese and Michael Palin squared off against Malcolm Muggeridge (played here by Michael Cochrane) and the Bishop of Southwark (Roy Marsden), and incorporates a substantial chunk of the actual dialogue from that broadcast, the film isn’t a straight docudrama. It’s a surreal riff on the controversy, that includes animation, homages to Python sketches and the Python members’ solo work, and fantasy sequences wedged into a film that is itself, basically, one long fantasy about how the Pythons themselves might have treated their situation. It’s probably a common daydream, especially among comedy geeks, to so fully master the style of a favorite artist that one could do work in their voice that’s fit to stand alongside the work that inspired the imitation, effectively adding new work to their canon. I don’t know how many people have made good on that dream. The list might begin with Dave Sim in his Groucho-resurrecting prime, and it just might end with him, too. Holy Flying Circus gives it a good try, but the acid test of any attempt to co-opt Python humor is probably whether it’s funny, and when John Cleese turns into Basil Fawlty and thrashes one of his critics with a tree branch, or Michael Palin turns out to be married to a Terry Jones drag character, or the Pythons, in discussing how best to answer the charges of blasphemy, keep slipping into performing the “Argument Clinic” sketch, the viewer is less likely to laugh than to murmur, “I get it, that’s… interesting.” At the risk of committing blasphemy myself, one problem may be that the filmmakers actually love the Pythons too much. If that is a problem, it was probably an insurmountable one, since no one who only loves Python to a sane and reasonable degree was ever going to conceive the idea for this movie. Eric Idle once addressed the charges that Life Of Brian was conceived as an attack on Jesus by saying that, when he and his partners first came up with the idea of doing a Biblical epic, they were quite eager to attack Jesus but had to go in another direction when they started doing their research and concluded that they couldn’t find anything objectionable about him to make fun of. Holy Flying Circus makes a few token gestures towards mocking individual Pythons, most notably in the stray jokes about what a money-grubbing whore Eric Idle is supposed to be, but basically, any comedy about a comedy troupe that casts Stephen Fry as (literally) God isn’t going to be on the side of whoever is trying to make trouble for the comedians. The performances can scarcely be faulted, except maybe for Phil Nichols’ Terry Gilliam, though it would be asking a lot of any actor to do a halfway credible version of Gilliam’s American-expatriate accent and vocal rhythms, just as it would be beyond the call of duty to ask a man who is hoping to ever get laid again to appear in public in a version of the young Gilliam’s hippie-Dutch-boy shag haircut. Rufus Jones (as Terry Jones) and Steve Punt (as Eric Idle) both turn in uncannily accurate performances. As John Cleese, Darren Boyd does a compelling, eerily perfect imitation of Cleese’s voice and speech patterns, which emerges from a face as dead as a Madame Tussauds waxwork. It’s clear that Tom Fisher is playing Graham Chapman, because he’s the one with the pipe. He has no other particular qualities, aside from occasionally piping up to remind everybody that, yep, he’s still gay. Considering how great Chapman was at just, as Jerzy Kosinski used to say, being there—a singularly underappreciated quality that made him, as if by default, the perfect leading man for the group’s two sustained-narrative movies—this seems perfect. The sequence pales next to the actual debate itself, partly because the bad guys here ham it up too much, always a danger when playing a couple of hams; if the actual Muggeridge and the Bishop played to the peanut gallery, Cochrane and Marsden are projecting to the distant reaches of the solar system. Holy Flying Circus, which gets extra points for being the most gleefully perverse programming choice for this Easter weekend, ought to be released on DVD, with the original talk show included as a bonus feature. Or else the BBC can release the original talk show as a DVD and call the movie the bonus feature.